Empower yourself or your organization and impact success with the tools and information provided by Appeals for Art. Odds are that at some point in your career, you have been or will be asked to donate your work to a charitable cause. Do you work for a charitable organization? If you’re a staff member, volunteer or supporter, perhaps it’s your task to contact artists to request donations. We believe that by empowering you with information and education, it is possible not only to make this process mutually beneficial but to increase the profitability for both artists and charities. 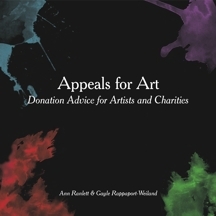 As full-time artists and businesswomen, we saw the need to create guidelines for donating art and for charitable requests. We have compiled this information from our own personal experiences and those of artist friends and colleagues. While our focus is on art-related donations, many of these guidelines apply to other professions as well. Art is indeed a business and we know this information is critical to the success of both the artist and the organization. Click here to request the document. The content of this site is not intended to constitute legal or tax advice. Please consult your attorney, financial adviser or CPA for professional advice.